It is just plain creepy. Zhang Ruifang is 101-year-old grandmother who lives in China. She is probably like any other grandmother except for one thing, errr, two things: Zhang has recently sprouted a 6cm horn on the left side of her head... and it appears that she is in the process of sprouting another one on the right. The growth is probably a "cutaneous horn" which is a tumor made of keratin, the stuff your fingernails are made of. 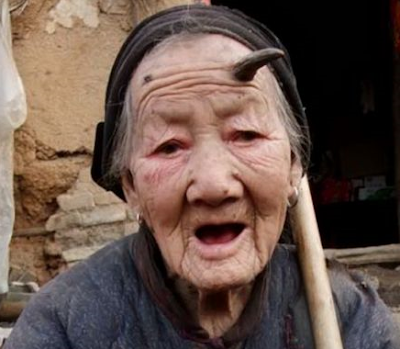 For a similar story about a woman with a single horn- link.